My Thoughts on Company and Organization Acronyms and a Little More. (San Diego, California, USA): How many times have you see an acronym in an article, on a website, on social media, in an email and have no idea of the meaning of the acronym? I looked up the acronym ABC on the Acronym Finder website and I found around 200 different meanings for the acronym ABC. A few examples of ABC are: the American Broadcasting Company, Australian Broadcasting Corporation, Atlanta Bread Company, Already Been Chewed (gum), Advancing Blade Concept (helicopters) and to the Albuquerque Bicycle Center. Access the Ladder to English Advancement, Accord de Libre Echange des Ameriques, Airborne Law Enforcement Association, Artificial Life and Evolutionary Algorithms, American Law and Economics Association, Arizona Law Enforcement Academy, Aquatic Lands Enhancement Act, Associazione Laureati Economia Aziendale, Asian Law and Economics Association, Assistance to Law Enforcement Acta, Australian Literacy Educators' Association, Australian Livestock Exporters Association and Automotive Leather Eleganza Atelier. HAL America Inc., Hamamatsu Agency for Innovation, Handbook of Artificial Intelligence, Harvard AIDS Initiative, Hauling Anything Incorporated, Health Action International, Health Alliance International, Healthcare-Acquired Infection, Healthcare-Associated Infections, Helicopter Association International, Help Association Inc, Hellenic Aerospace Industry, HelpAge International, Hemagglutination Inhibition, Hepatic Activity Index, Hepatic Arterial Infusion, Higgenbotham Auctioneers International, High Altitude Indoctrination, High-Current Arc Ignition, High-Level Analog Input, Higher Authority of Intelligence, Histology Activity Index, Historically Advantaged Institution, Hockey Art International, Home Automation, Inc., Horizontal Advance Increment, Hospital Acquired Infection, Hot Air Injection, Hotel Adelaide International, Hotel Association of India, Human Amyloid Imaging, Human Appeal International and the Human Awareness Institute. While having an acronym in a logo is currently an acceptable practice, in my opinion, the very best logos have the company/organization name spelled out in the logo without an acronym. But there are always exceptions because sometimes, the spelled out company name and acronym works well. For example, Helicopter Links logo has uses our name and it's acronym. We never, ever refer to Helicopter Links as HL but for the logo, it seems to work. I've seen logos where it's part acronym and part words. The other exception to having a company name not spelled out and when one can break all the rules, is when a large company with millions of dollars to spend each year, over time, can brand their logo. In the case with Nike, their Swoosh. 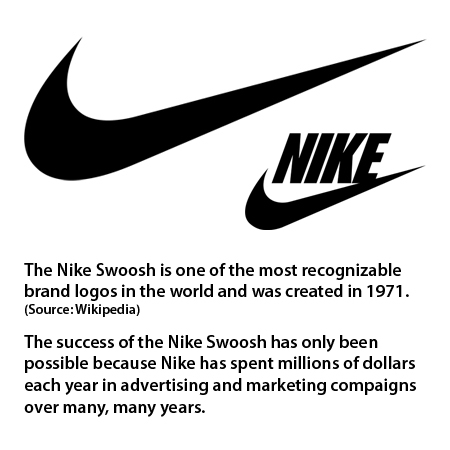 According to several articles noted on the Swoosh Wikipedia page, the Nike Swoosh is one of the most recognizable brand logos in the world. With millions to spend each year and over time, you can break most rules and get away with it. My proposition is that when a small company doesn't have millions of dollars to spend each year in branding campaigns, it's better to write out the company name in all instances (logos, articles, your own website, social media, emails) because one wants to create the least amount of confusion and to create excellent communication, so that readers know for sure, what organization is being written about. Just because a person intimately knows their own organization's acronym, doesn't mean the reader has the same inside knowledge. At this point in my article, do you disagree with me? Then I recommend to re-read this article from the beginning and pay particular attention to the multiple ways you can decode of ALEA and HAI. Being completely honest with yourself, can you immediately translate both ALEA and HAI correctly, out loud, without looking up? It seemed to me that before 2000, I really didn't see as many different acronyms as I do today. Maybe the rise of acronyms happened in the 1970s or 1980s, I really don't know. But as more people use the internet and more companies are created, it seems that more and more people have an urgent need to create a special acronym for their business and organization. But are acronyms always necessary? I think there are many instances where acronyms are necessary in certain industries, in science, with products and services, where people refer to specific items using its acronym. But when it comes to an organization's name, I would recommend to be careful using an acronym. In my opinion, there are several things happening today with acronyms. 1) In general, it seems that people are throwing acronyms all over the internet without decoding them and not caring if people can unravel them. 2) I think that many people are so accustom to their own acronyms in their own world, they assume everyone knows them too. Is the best approach? 3) I think there are several reasons why people throw out acronyms at a moments notice. 3A) They simply have not thought about the confusion they are bringing to their readers due to their lack of education which is an honest mistake or they are being arrogant and trying to prove they are smarter than others. 3B) They think it's correct to use acronyms at all costs, and that that's the way it should be! Try not to use acronyms of business or organizations when writing articles, when speaking about your own company on the business website or on social media. Here is something to think about. In some high school writing classes, they teach students that when writing a paper (or an article) to assume the reader does not know you and has no knowledge of the subject you are writing about. This is the approach I take when I write articles, a website, blog articles, emails and when I post on social media and is the reason that I try to rarely us acronyms when writing. Officially, for articles, in the first instance of an acronym needs to be spelled out with the acronym following in parenthesis. Then the next instance of the word can be the acronym. For the first instance example: Helicopter Association International (HAI). The second instance would be like this, HAI. Unofficially, my personal recommendation is to write out all your company/organization names for the entire online article. To me, writing an acronym instead the spelling out the business name is devaluing each word in the name of the business. 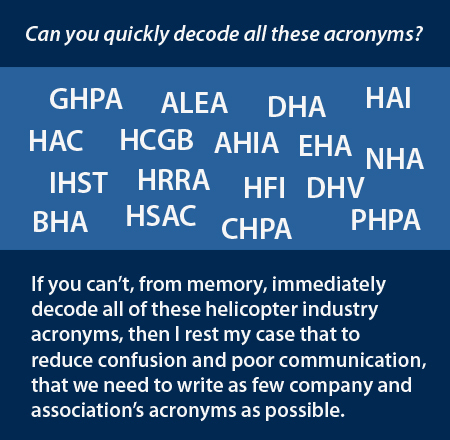 I am also tired of seeing so many acronyms and being confused! As a reader, I really don't want to have to memorize your company's acronym. It's too much work. As a reader, I want to enjoy the article and have to work to understand the point of the article. As a writer, I also have no interest in forcing the reader to constantly making them scroll up and down on a web page, just to decode several acronyms. I would say that many professional writers would completely disagree with my unofficial comment above but this is how I feel. In my book, a few extra words is not going to make your online article or web page too long. And I bet the reader doesn't even notice if you are not using acronyms! If you have your own blog or website, you can do what you wish. If you are working as a writer for someone else, you will have to follow their rules, since they are paying you! If you are writing for a particular industry, assume the person is new to that industry. Think from the reader's perspective. That is, have some compassion and empathy for the reader. Not everyone loves or knows your company or organization as much as you do! Please remember that your readers can be from the approximately 196 countries (and other places such as islands, provinces, territories, and etc.,)s from around the world. The reader might not live in your country! Imagine. Remember that your reader's first language might not be your own language. Try to avoid using slang or idioms as much as possible. Unfortunately, this is not always possible but it's good to be mindful of these things. By not writing in slang or using idioms, it makes the article easier for people to translate articles and websites into other languages. The same is true with acronyms. They don't translate well in online. When writing online or in an email, there is no need to try to save space by using an acronym. If the goal is to have clear communication, then write it out! A few other writing tips. Take an adult course on writing. Buy some books on writing and/or use the library. 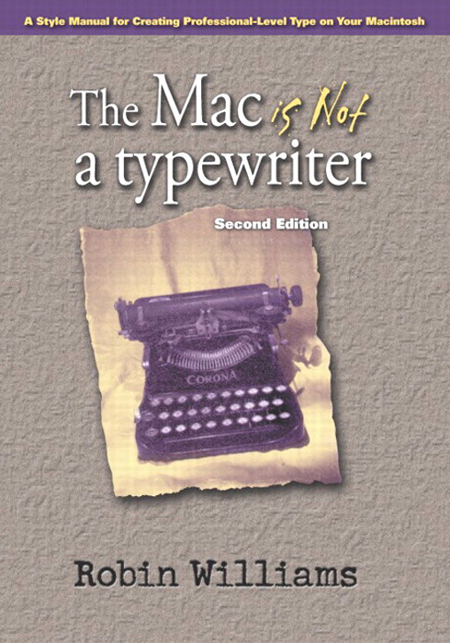 Buy the book above called "The MAC is Not a typewriter" by Robin Williams. (She also has a book titled, "The PC is Not a typewriter".) It was originally published in 1989, with a 2nd Editions printed in 2003. While this book is not a book about acronyms, is still an extremely relevant book to help you understand some good methods to make you a better writer in the age of computers and the internet. There is the "Associated Press Stylebook", a reference for journalists, students, editors and writers. Look online and see if there are any free courses or websites to help become people become better writers. Reading also helps people become better writers. My last thoughts are that trying save space online by using acronyms, is complete nonsense. (There are certainly exceptions to my own recommendation. Sometimes acronyms are necessary. The horror!) My hope is if writers keep these things in mind, a few extra key strokes will provide crystal clear communication and reduce miscommunication for your readers from around the world.